A lot of people are probably aware that it’s a favored tactic of the corporate right to buy off and manufacture “grass roots” support for their lobbying efforts, but it still never ceases to amaze whenever one actually confronts the fakery in real life. For the latest ridiculous example, check out a pair of recent stories from the good people at Media Matters for America regarding the dreadful GOP tax plan in Congress. It turns out that the corporate lobby arranged to have some almost identical op-eds placed in several major newspapers that weren’t even really written by the authors who names were attached. ‘The drumbeat for tax reform did not waver over the long Thanksgiving weekend,’ proclaimed a press release about ‘state leaders’ from Republican House Speaker Paul Ryan’s office, which included that ‘West Virginia’s state director of the National Federation of Independent Business, Gil White, doubled down on the benefits to small businesses in the state’ in an op-ed. ‘Across the country, real Americans recognize what they stand to benefit,’ read a press release from the Republican-controlled U.S. Senate Committee on Finance, which cited op-eds from National Federation of Independent Business (NFIB) West Virginia director Gil White and Dan Lloyd, the plant manager for Procter & Gamble’s Green Bay, WI, manufacturing facility. But those op-eds were deceptive cut-and-paste jobs that appeared virtually word-for-word in other publications by different authors and were part of a pro-corporate tax cut media campaign by a deep-pocketed business lobbying group and one of the largest corporations in the country…. A November 17 op-ed by NFIB Kansas state director Dan Murray in the Topeka Capital-Journal (KS). A November 23 op-ed by NFIB Louisiana state director Dawn Starns in the Shreveport Times (LA). A November 26 op-ed by NFIB West Virginia state director Gil White in The Intelligencer (Wheeling, WV). A December 2 op-ed by NFIB Florida executive director Bill Herrle in The Palm Beach Post (FL)…. 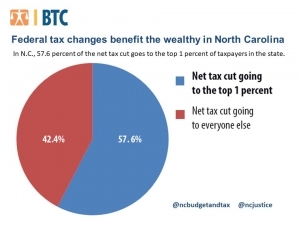 The bottom line: There’s a reason corporate lobbyists and their hired helpmates in Congress like Richard Burr and Thom Tillis have to manufacture “astroturf” support for their cash grabs to benefit the 1%: the real stuff doesn’t exist.